Polyurethane Spray Foam Roofs help to keep your business or home's roof protected from weather, temperature changes, and pests. What is Polyurethane Foam Roofing? Polyurethane is sprayed in a liquid form which allows it to fill undulations, the cracks and fractures, in a roofs surface. Once applied, the liquid urethane foam expands to over thirty times it’s original volume, hardening to create a closed cell monolithic, singularly uniform, roof surface. After the expanded Urethane foam dries, typically within mere seconds, the now hardened surface seals the roof into a weather tight and energy efficient adherence. 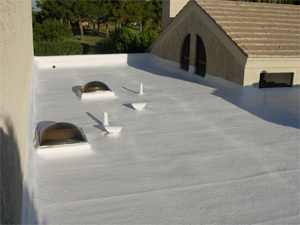 The polyurethane foam roofing adds nominal weight to the buildings structure, therefore also allowing the foam to be used in reparations of the unique deficiencies in the roof. After the perfect thickness is measured out and molded to reach the established specifications an elastomeric coating or gravel is applied to give the roof inclement weather durability. This durability can also be walked on during standard inspection. As previously mentioned, the now weather sealed urethane foam roof provides durable insulation for the building translating into energy usage savings and lowered monthly utility bills. This form of roofing has been used for over 50 years and has a proven durability requiring nothing more that normal scheduled maintenance. So Again, What Are Some of the Benefits of Polyurethane Foam Roofing? These are just a few of the excellent reasons to make the decision to use Polyurethane Foam for your roofing solutions. And the best place to go for your roofing needs is 1st Class Foam Roofing! The durability of the Polyurethane roofing system lasts much longer than that of other roofing options. By electing to use the Polyurethane foam from 1st Class Foam Roofing for your roof, you will ensure that you see the savings add up with it’s energy efficiency and minimal to no maintenance needed. 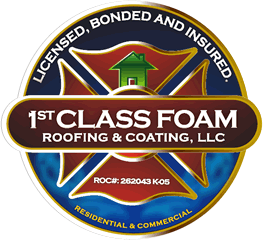 This roofing solution will benefit the lifetime of your structure and decrease the expenses it takes to operate your building and all of this can be done by your foam roofing experts at 1st Class Foam Roofing!